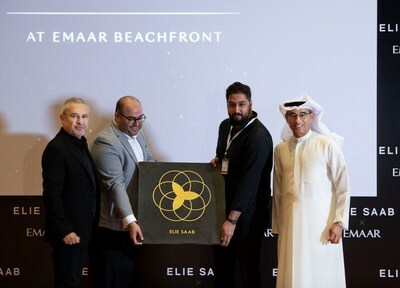 DUBAI, UAE, April 5, 2019 /PRNewswire/ -- Luxury has a new destination: ELIE SAAB at Emaar Beachfront, a gated island destination in Dubai, was unveiled at Dubai Opera by Mohamed Alabbar, Chairman of Emaar, and Elie Saab, founder and Chairman of ELIE SAAB Group. Emaar, the global developer, is partnering for the first time with the renowned fashion designer for the new residential development. Reflecting the innate elegance and exceptional detailing that sets Elie Saab apart in the global fashion world, the sumptuous residences will reflect the luxurious heritage of ELIE SAAB's style and signature. Mohamed Alabbar said: "Elie Saab is the pride of the Arab world, and a fascinating international success story. Through our first association with Elie Saab, admired by the world's leading celebrities, we are offering discerning customers a new lifestyle address. Every aspect of these glamourous residences is personally designed by Elie Saab." Elie Saab said: "We are delighted to collaborate with Emaar and Mohamed Alabbar on this new project. Over the years, ELIE SAAB has evolved into a lifestyle brand, through the development of diversified product categories that deliver a unique experience of the brand's universe. Through this new collaboration, brought by Emaar, leaders and experts in real estate, ELIE SAAB is confident that its aim at extending the brand experience into home and interiors will be a granted success." In addition to 1 to 3-bedroom apartments, the tower by ELIE SAAB at Emaar Beachfront will have an exquisite collection of ELIE SAAB four-bedroom penthouses – overlooking the Arabian Sea, The Palm and Dubai Marina. Designed to celebrate the 1930 Art Deco era, the tower serves as a subtle landmark of elegance and composure. Ground level boutique fashion stores, galleries and cafes as well as lobbies designed by ELIE SAAB promote the feeling of luxury. A pool deck, inspired by chic Miami lifestyle, and an infinity edge swimming pool facing the Palms, gym and recreational facilities add to the quality of life, and are designed for haute living. ELIE SAAB at Emaar Beachfront enjoys an exclusive island lifestyle overlooking the sea and the Palm offering a private beach, private marina, and several sport and resort-style facilities for a wholesome lifestyle. Call +1-800-36227 (UAE) or +9714-3661688 (International); or email: sales_enquiry@emaar.ae.